Pixar used to be risk takers. They were the studio that made a movie with no songs in it in a world where that seemed like madness. They made movies about a failed superhero working as an insurance salesman, an old man taking a chubby asian kid on a journey to south america and a silent film about a robot in love. I’m happy to see that they are bringing back those kind of ideas and executing them as perfectly as they did in Inside Out, Pixar’s bravest film since Up. The characters of inside out are tragic characters in their core. Bound by their nature to a single personality trait forces them to forever chase only one line of thought. When failing to fulfill their attributed emotion, they relentlessly try over and over again. Sadness can’t resist looking at the sad side of things, trying to remember Riley’s events as sad ones, and Joy will always – ALWAYS try to cheer things up, sometimes to a fault. This brings up some very deep issues of the inner working of people’s mind, in a way that I’ve never seen before, especially not in an animated movie made mostly for kids. If you’re a parent watching this movie with your kid, you will both have very different experiences. That is because Pixar have cleverly disguised the emotional metaphors with crazy funny adventures, that kids would enjoy with or without the message behind them. As adults though, it is impossible for us to ignore the genius behind a clever line or an imaginative location. Because this idea is so incredibly original and well executed, certain plot points that you might have seen coming in other movies came as a surprise for me and caught me off guard. This is due to the fact that I spend the whole time watching the movie trying to see the 2 layers presented to me. The ‘on the surface’ layer, which is what happens in the movie, and the ‘under the surface’ later – which is what everything you see means. The story takes place inside of Riley’s head. Riley is an 11 year old girl from Minnesota who’s family has relocated to San Francisco. She now has to deal with the challenges of adjusting to a whole new place. Inside of Riley’s head are 5 emotions that are running the show. Joy, Sadness, Fear, Disgust and Anger. The emotions, however, are mostly governed by Joy, who seems to be in charge. That premise makes somewhat sense, since our younger years tend to be less emotional and dramatic than our teen years. However, things quickly change as Joy does not seem to be able to control the emotions so effectively, especially Sadness. Joy tries to keep Sadness away and distract her as to not let her in. That is the first taste we get of the film’s amazing way of using metaphors and hidden messages to tell a story. The film doesn’t miss any single opportunity to have fun with the world in it, weather if it’s freezing the characters when Riley has ice cream, demonstrating “brain freeze”, or getting into the studios of Dream Productions where we see how dreams are made like a low budget Hollywood film. The film takes you from laughing out loud, to thinking hard trying to figure out what they meant when they said or did that thing. It also takes you to very deep and sad moments that will cause you to tear up in a heart beat. I’ll be honest, I was concerned with Pixar’s direction in the last few years, making films like Brave, Cars 2, Airplanes, and Monsters University, which I thought were not up to the Pixar standard. 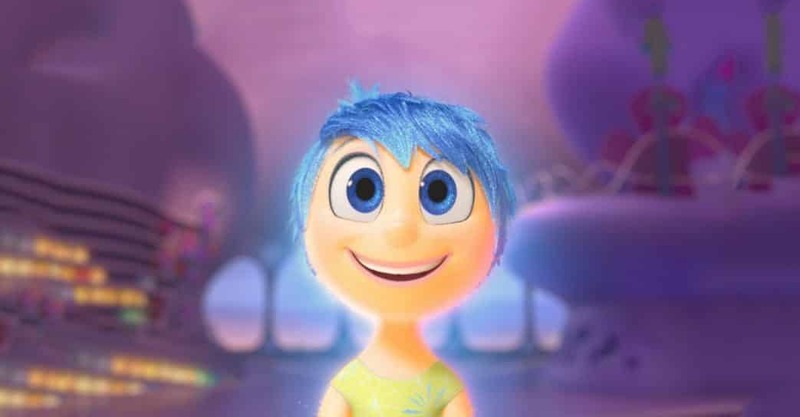 Inside Out, in my opinion, brings Pixar back to being the most innovative animation studio out there.